1 Preheat oven to 375°F (190° C). 2 Combine ½ of the Knorr® Homestyle Stock Chicken, herbs and garlic in small bowl. Rub mixture under chicken skin, then spread remaining on outside of chicken. Arrange chicken in roasting pan and roast 2 hours or until meat thermometer inserted in thickest part of the thigh reaches 180°F (90°C). Remove chicken from pan and let stand. 3 To make gravy, combine water with flour in small bowl, then stir into pan over medium heat. Stir in remaining Stock, scraping up brown bits from bottom of pan. Cook, stirring frequently, 5 minutes or until gravy is slightly thickened. Strain, if desired. 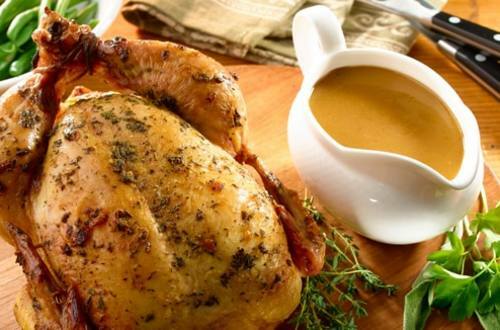 Cut chicken and serve with gravy.